Sellier & Bellot JSC, a joint-stock company, ranks among the leading engineering companies in the Czech Republic. The Company maintains also significant positions on European and overseas markets, where more than 70% of its production is being exported. 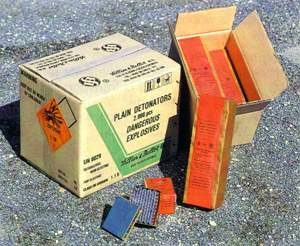 Blasting components (such as: detonating cords, safety fuses, detonators, etc.). The Company‘s Business Plan for this year includes a further increase in the expected profitability of business activities and the development of main production branches. Research & development activities are therefore directed to improving product quality and labor productivity as well as to expanding production capacity. Challenging tasks, both for top management and engineering personnel, are presented by the demand to quickly update the Company's manufacturing procedures to comply with NATO standards as well as to develop new projects which would deal with and satisfy the future needs of the Czech armed forces. Sellier & Bellot products were always noted for their high quality, precision, reliability and safety in use. They achieved outstanding succes in the 2000 and 2004 Olympic Games. Among them you would hardly find anyone who is not aware of the Sellier & Bellot trade mark. Generations of Czech huntsmen owe to this mark for their extraordinary hunting pleasure. Among Czech sportsmen, closely co-operating with the Company, you would find Olympic winners, world and European champions and World Cup winners. Semi-jacketed GameKing bullets are designed for hunting at long range, where their accuracy and extra margin of performance can make the critical differance. The streamlined tapered base of the boat tail bullet greatly reduces drag, which results in higher retained velocity, greater striking energy, a flatter trajectory and less wind drift than comparable flat base bullets. The PTS bullet is the result of efforts of hunting cartridge designers to develop bullet with high wounding effects preserving concurrently excellent ballistic values. The bullet with lead core is covered with strengthening casing and furnished with polymer tip. Optimum shape enables the bullet to achieve higher speed and trajectory stability. These characteristics ensure excellent accuracy and wounding capability of the bullet that remains compact even at the moment of the strike,it does not shatter and it does not impair game. Together with Sierra and Barnes bullets, PTS bullets extend the range of rifle cartridges used for hunting and they extend possibilites of optimum choice for various kinds of use. The cartridges are used with expanding devices of domestic and foreign production. The largest utilisation of cartridges was recorded in building, metal and power industries.The advantage of using cartridges in the industry lies in low elaborates, reliability and with no further demands on energy sources.Cartridges for expanding devices are produced from CuZn 30. Detonator No. 8 AI is a basic ignition agent to initiate detonation and detonating cord. Use is permitted at working places without danger of an explosion of gases and dust. Detonator fuse No. 8 AI is initiated into operation by a flame of burning fuse or by electric detonator. It is used within a range of temperatures from -15 °C to +35 °C. Diameter of the detonator: 7.30 mm max. Technological limitation - maximum dimensinons of produced parts.